The workshop, facilitated by the NAB and Ministry of Education, took place on August 25th and 26th at the Sunset Shores Hotel conference room under the theme âPreparing for takeoff: challenges faced by accreditation agencies in establishing quality in tertiary educationâ. The two-day session was conducted by Executive Director of the University Council of Jamaica Dr. Ethley London, who, during the eventâs opening ceremony, lauded the newly formed local board for the great quantity of work done since its inception. She however indicated that the four month old organization still has a long way to go, but was on the right path to getting things right. One of Londonâs main areas of focus at the workshop was the various angles of quality in education, which involves the students, teachers, curriculum and assessment. Other topics looked at and discussed during the workshop included the criteria, benefits and process of accreditation, challenges of accreditation and the role of the National Accreditation Board, among other topics. 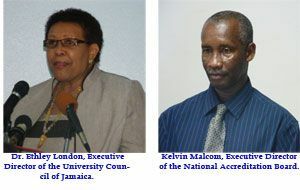 Chairman of the NAB Dr. Rosalind Ambrose indicated that the two-day exercise is expected to put the Board on a better footing in its effort to oversee and maintain the academic standards seeking accreditation. Ambrose said the accreditation process will serve as a reflection of how St. Vincent and the Grenadines measures up in the quality of higher education on the regional and international stage.